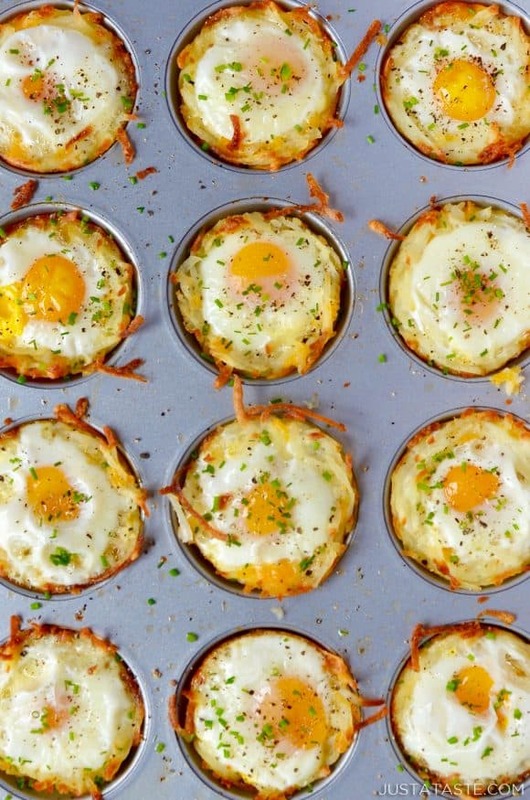 Take the stress out of breakfast prep with this fast and fresh recipe for Cheesy Hash Brown Cups with Baked Eggs. I’m officially back to working full-time after the birth of my second little guy, Evan, three months ago, and as any and all nursing mommas can relate: THE HUNGER IS REAL. I don’t know what it is about nourishing a baby that makes me more ravenous than when I’m eight months pregnant. I am a bottomless pit. Insatiable. Ravenous. All the dang time. And that is why the combination of early-morning protein, cheese and starch has been my go-to these past few months, as a good ol’ bowl of cereal just ain’t cuttin’ it. 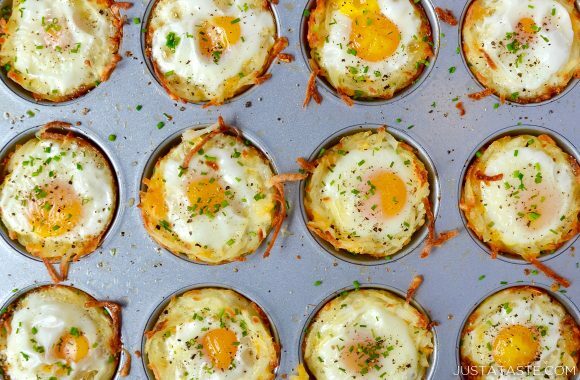 So cue the Cheesy Hash Brown Cups with Baked Eggs! The real beauty here is that not only are these cups super filling, but they’re also easily enjoyed with a single hand (if you don’t mind a little runny yolk here or there). And with two babies under age 2, you’d be surprised at the number of things I’ve learned to do with one hand. Feel free to mix up the fillings with your preferred cheeses, chopped veggies or even diced ham. They’re a full morning meal in a single cup, and if history is any indication, then we know that muffin tin breakfasts are a big hit around here (looking at you, Baked Oatmeal Cups!). You can shred your potatoes from scratch, but I’m partial to any time-saving measure possible, which makes the pre-shredded bags of potatoes (usually found by the eggs in most supermarkets) a real home run in my book. So grab the taters, cheese, eggs and herbs and get ready for the ultimate meal in a muffin cup! Preheat the oven to 400°F. Grease two muffin tins with cooking spray or melted butter. 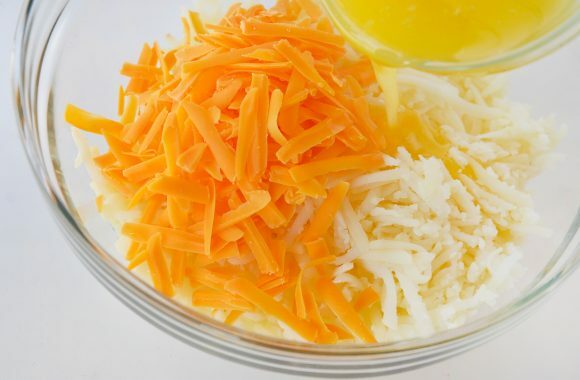 In a medium bowl, combine the hash browns, shredded cheddar cheese and melted butter. Divide the hash brown mixture among the 12 muffin tin cups (they will be very full but will shrink as they bake), pressing the potatoes into the bottoms and up the sides of each cup. 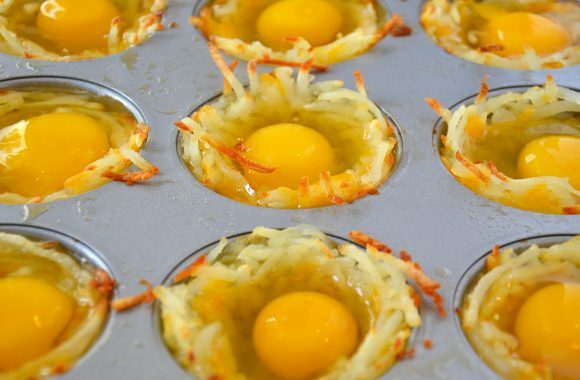 Bake the hash brown cups for 25 minutes then remove them from the oven and using a dry measuring up or spoon, push down the centers of the muffins to make enough room for the eggs. Crack an egg into each cup then top each egg with salt and pepper. Return the hash brown cups to the oven and bake them an additional 12 to 15 minutes or until the eggs reach your desired doneness. 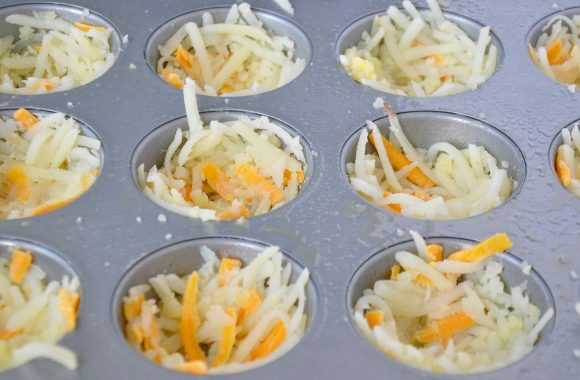 Remove the hash brown cups from the oven and let them cool for at least 10 minutes in the muffin tin before running a sharp knife around the edges to release them. Top the hash brown cups with the chopped fresh chives and serve.